Besant Technologies offers best Cognos Training in Bangalore with most experienced professionals. Our Instructors are working in Cognos and related technologies for more years in MNC's. We aware of industry needs and we are offering Cognos Training in Bangalore in more practical way. Our team of Cognos trainers offers Cognos in Classroom training, Cognos Online Training and Cognos Corporate Training services. We framed our syllabus to match with the real world requirements for both beginner level to advanced level. Our training will be handled in either weekday or weekends programme depends on participants requirement. We do offer Fast-Track Cognos Training in Bangalore and One-to-One Cognos Training in Bangalore. Here are the major topics we cover under this Overview of Business Intelligence, Overview of Data Warehousing, Overview of Cognos 10.1 BI and Architecture, Cognos 10.1 BI Administration, Cognos 10.1 Connection, Cognos 10.1 Framework Manager (metadata modelling), Cognos 10.1 Query Studio, Cognos 10.1 Analysis Studio, Cognos 10.1 Report Studio. Every topic will be covered in mostly practical way with examples. Besant Technologies located in various places in Bangalore. We are the best Training Institute offers certification oriented Cognos Training in Bangalore. Our participants will be eligible to clear all type of interviews at end of our sessions. We are building a team of Cognos trainers and participants for their future help and assistance in subject. Our training will be focused on assisting in placements as well. We have separate HR team professionals who will take care of all your interview needs. Our Cognos Training in Bangalore Course Fees is very moderate compared to others. We are the only Cognos training institute who can share video reviews of all our students. We mentioned the course timings and start date as well in below. BDreamz Global Solutions Private Limited (Owner of Besant Technologies® Brand) is the unique Authorised Oracle Workforce Development Partner, Authorised Microsoft Silver Learning Partner, Authorised Pearson Vue Exam Center, Authorised PSI Exam Center. 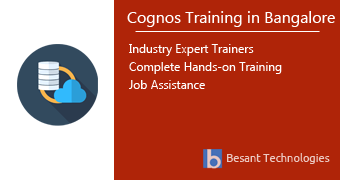 Here are the Cognos Training Classes in Bangalore Schedule in our branches. If this schedule doesn't match please let us know. We will try to arrange appropriate timings based on your interest. Average salary for a Cognos Professionals in Bangalore? As per the latest reports from top research firms in salary survey like PayScale and Glassdoor, Cognos Professionals are earning an average salary of Rs. 659,837/- per year in Bangalore. It varies based on city, industry, total years of experience and more. Our Cognos training in Bangalore helps you to go even beyond the average salary as mentioned above. What roles are offered by companies for Cognos professionals? It might depend on every individual company. But, widely these are the roles anyone can expect after successful completion of Cognos Training in Bangalore. Which companies are hiring Cognos Professionals in Bangalore? According to popular job portal Naukri, there are numerous companies are looking for Cognos professionals in Bangalore. Some of the companies looking for expert Cognos professionals are White Horse Manpower Consultancy, Microland Limited, Sheorey Digital Systems, Future Business Tech India Private Limited, Magna Infotech, Imedx Information Services, Aequor Information Technologies, Right Soft Options, Computec Professionals Group, etc. You can utilize high speed free internet in our premises. You will get "n" number of contacts who are working in varies companies which will increase industry exposure. You will get all relevant documents for further exploration to be a master. We’d installed power backup for all classrooms. We assist in International Certification if any such things available. If you are alumni of Besant Technologies, you will get more discounts in course fees. Bangalore aka Bengaluru is the capital city and one of the largest IT hub of Karnataka. It holds the name of “Silicon Valley of India”. Bangalore is hub of all top IT companies in the world. Notable companies are SAP, Amazon, Infosys, Accenture, Wipro, TCS, IBM, Oracle and Google. This Cognos Training in Bangalore will give you more confidence if you are interested to pursue your career in the track of DWH, BI, Data Science & BPM Category. All our participants will get most of hands-on training with more real-time approach. We are having multiple branches in this beautiful city to offer best in class Cognos Training in Bangalore. Get fast and reliable learning partner to move your career in right direction. Besant Technologies Bangalore will be the right choice to make the above happen. Call us or fill the quick enquiry form to get standardised quote about Cognos Training as soon as possible. Our Besant Technologies Bangalore Reviews are listed here. Reviews of our students who completed their training with us and left their reviews in public portals and our primary website of Besant Technologies & Video Reviews. Hi, i finished my selenium training in this institute. Really superb training. Working persons and freshers easily can get real time knowledge here..
Java course I had learned in your institute will be very much useful for me to improve my programing skills.Now,i get much more better confidence.. The class was informative and easy to understand. One of the Best Android training institute in Marathahalli Besant Technologies.. Sessions were detailed oriented. Each and everything was explained in detail with examples. Completely it was practical sessions which I liked most.. I was joined to Python training in Besant technologies under Anand Sir. The training was very good with good reasoning, practical problems and clearing all concepts .They also give practical experience..
HI i am Deepan. I completed my AWS Course in Besant Technologies Bangalore Indira Nagar branch. The training is really awesome. The trainer explained all the concepts in detailed manner. It really helpful for my project. Thanks to the trainer and the team of Besant Technologies. Hi i completed my Hadoop course in Indira Nagar. Trainer Mr.Karthick is a excellent trainer. He had good experience in Hadoop. All the concepts explained in both theoretical and practical manner. The doubt clearing session is very helpful to gain deep knowledge in Hadoop. Best hadoop training in bangalore. Students who were enrolled for this course most likely joins in any of these courses additionally to enhance their profile in IT industry. Besant Technologies branches in bangalore are listed here. And most popular locations where students / professionals are lining up to get trained with us. Besant Technologies branches in bangalore are listed above. And most popular locations where students / professionals are lining up to get trained with us.